What's Color Club Planning for Spring 2010? The lovely and gracious Yen from Victoria Nail Supply just sent over a teaser photo of some of Color Club's Spring/Summer 2010 collection shades. I will be getting more information on this hopefully next week, including nail wheel swatches. I apologize that I don't yet have the name of the collection or any other details about it, but I'll let you know as soon as I do. It's no surprise that they're following the pastel creme trend now, is it? I'm guessing those are cremes, don't you agree? Color Club collections normally include 6 polishes, so along with all of my other assumptions in this post, I'll go with that thought! Not much information, but the shades are pretty and I'm really drawn to the green one. What do you think? Are you still enjoying the pastel trend or have you had your fill? That purple is intriguing me, I can't wait to see swatches of it! I cannot wait :-), purple looks so nice (is it more blue toned than China Glaze grape pop?). Are they cremes or neons? I really enjoy pastel trend, orange purple and pink to be precise, not so much green and yellow. I do like them on pictures but on my nails they look just weird. Now I don't know what to do! I was planning to get all the bright shades from the "Up and Away" collection, but these look very similar. This new "hobby" of mine is spiralling out of control and I have to learn to be pickier. I can wait a bit longer to see your swatches. Not my kind of colours. I like the pastel trend, and these polishes look a bit different from the norm. Can't wait to see swatches! I think I'm kinda blah about pastels unless they at least have some micro shimmer. WOW, purple one looks great! But then again I AM the purple junkie. I can't wait to see these! CC has great colors and I'm actually really starting to love creams and pastels. 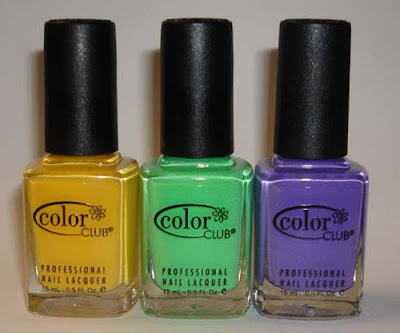 Man, I am so excited to see what Color Club will do. Ordinarily lately I've been overwhelmed by the stuff they put out - so these should be good! Thanks for the sneak peek Mary! gildedangel~that looks to be a rather unique shade of putple, doesn't it? I wonder if the color is accurate. I often have trouble getting purples to photograph. Shaimaa~I'm anxious to see these and the others in this collection too! Day~I wish I knew exactly what they were, but at this point, I do not. I like them though, a little brighter and different from the waves of pastels we're seeing! butters1984~yellows iin general aren't my thing, unless they're quite pale. I like the other 2 though. Elena~I know, we do have a problem, don't we?!! Hope to have more photos for you soon. Nienna~saves you some money that way then! Rebecca~I agree, these are brighter and the shades are a little different from they way they appear in the photos anyway. Kelly~the yellow one is the only one I'm not terribly fond of. Phyrra~truth be told, I am too. Mostly because I have a hard time applying some of these pastel and bright creme shades. nihrida~yes you are! It looks a bit different from most though, so I'm hoping that's the case in real life with it. Jessica~I do love Color Clubs, and I'm glad they're not really pastels, so to speak. Of course, we haven't seen the rest of this collection yet! Rachel~I think Color Club is really starting to get noticed, and for good reasons. They make a great polish and have some truly unique shades. Nicole~you're welcome! I'm sure they have some more great things planned! Michele~I think their Wild at Heart collection was one of my favorites from them. They definitely come up with some great shades. Can't wait to see these swatched. I'm looking at the green and the purple shades.